NASHVILLE, TN (May 4, 2015) – Big Spark Music Group powerhouse vocalist-songstress Olivia Lane recently made a visit to iHeartRadio Music Studios in New York City, where she performed an acoustic set, including her upcoming single “You Part 2,” which will hit Country radio on June 8th. 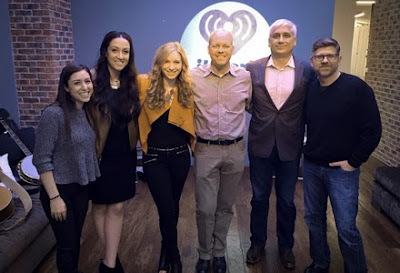 iHeartMedia Executive Vice President and General Manager of National Programming Platforms, Clay Hunnicutt, and staff heard the prominent newcomer’s debut single, “Steal Me Away,” along with other tracks off her STEAL ME AWAY EP while enjoying pizza and sushi. Lane was recently selected as one of only five emerging Country music acts for the Top 25 prestigious Macy's iHeartRadio Rising Star national campaign. In correlation with the contest, the singer released the lyric video for “You Part 2,” where she takes the reigns in the sassy video for the carefree track, written by the singer, Ilya Toshinskiy and Danny Myrick. The newcomer is on the rise with the release of her debut single, “Steal Me Away,” garnering national attention -- Country Weekly’s 2015 Who's New list and CMT’s Listen Up Discovery Music Program 2015. The talented singer is working on new music with producer and musician Ilya Toshinskiy and has been writing with some of Nashville’s top tunesmiths including Catt Gravitt (Jake Owen, “Alone With You”), Danny Myrick (Jason Aldean, “She's Country”) and Laura Veltz (Eli Young Band, "Drunk Last Night”). She is currently traveling nationwide on radio tour and previously opened for artists such as Wynonna Judd, Frankie Ballard and Randy Houser. The fresh-faced newcomer made the move to Nashville, TN, over a year ago to pursue music, eagerly following in the footsteps of her mother who was a country singer. Ever since she can remember, the 23-year-old has been immersed in the craft and tradition of country music and knew that Music City was where she would land after graduating from USC with a focus in music, songwriting and acting.